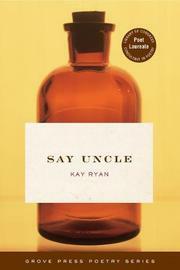 A by no means banal or unfathomable fifth collection from Ryan, whose treatment may seem more traditional than most readers are used to encountering, but whose themes are quite unconventional. She employs the occasional rhyme—often several in a single poem—in a natural-seeming way, neither stretched nor constrained to fit the poetic idea, but arising from it. Ryan has a refined musical ear and handles the elements of her compositions adroitly. There are internal rhymes, assonances, alliteration, iterations, and other devices rarely encountered these days. In Ryan’s hands, they are not merely stylistic overlays but, rather, integral to the poem. Language and thought merge, or at least peaceably coexist, as in days of yore. The short lines and quick images—almost snapshots—are elemental. Ryan puts them together, then pulls them apart, and twists them in playful fashion, as though she were an alchemist with a modern experimental attitude: I wonder what’ll happen if I mix these two. The seemingly disparate elements meld, as when she speaks of the “nutrients in failure—deep amendments to the shallow soil of wishes . . . the dark and bitter flavors of black ales and peasant loaves.” The metaphors work thanks to the consanguinity of the images, which Ryan selects with care, rather than plunking down a stream-of-consciousness gallimaufry and leaving it up to the reader to develop a taste for it. Truly short-line, one-stanza (for the most part) wonders: full-brained poems in a largely half-brained world.